The Massachusetts Department of Environmental Protection (MassDEP) announced in early June, and through the Office of Research and Standards (ORS), its recommendations on the Unregulated Contaminant Monitoring Rule 3 (UCMR 3) for emerging contaminants-specifically Perflourinated Alkyl Substances (PFAS). PFAS or Per- and polyfluoroalkyl substances are a group of man-made compounds that include perfluorooctane sulfonate (PFOS), perfluorooctanoic acid (PFOA), perffluorohexane sulfonate (PFHxS), perfluorononanoic acid (PFNA), perflouroheptanoic acid (PFHpA), and perfluorobutane sulfonate (PFBS). According the Environmental Protection Agency (EPA), all these UCMR 3 PFAS compounds have been detected in public water supplies across the US. 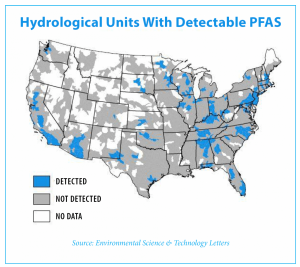 Since PFAS are considered emerging contaminants, there are currently no established regulatory limits for levels in drinking water. 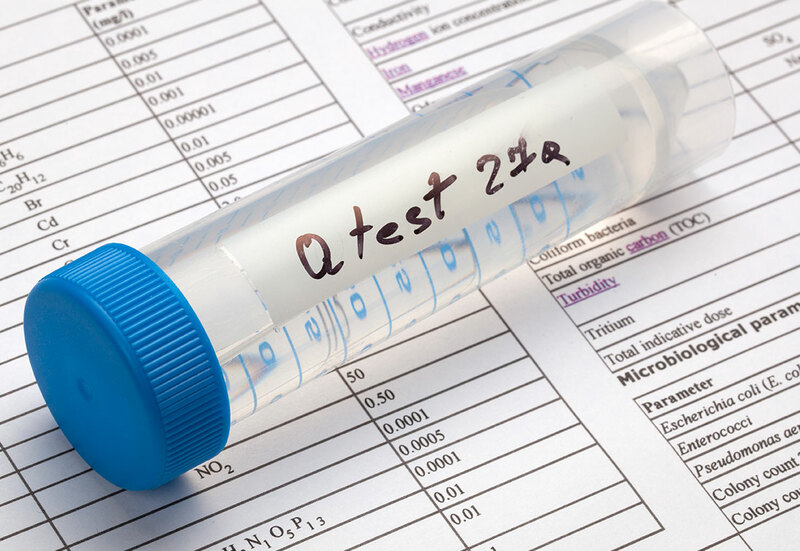 However, in 2016, the EPA set Health Advisory levels (HA) of 0.07 micrograms per liter (µg/L) or 70 parts per trillion (ppt) for the combined concentrations of two PFAS compounds, PFOS and PFOA. MassDEP’s ORS established drinking water guidelines that follows the EPA’s recommendations for health advisory levels at 70 ppt, which applies to the sum total of five PFAS chemicals – PFOS, PFOA, PFNA, PFHXS, and PFHpA. And, if the level of contamination poses unacceptable health risks to its customers, Public Water Systems (PWS) must take action to achieve safe levels. They also must provide public notice. Public Water Suppliers take immediate action to reduce levels of the five PFAS to be below 70 ppt for all consumers. 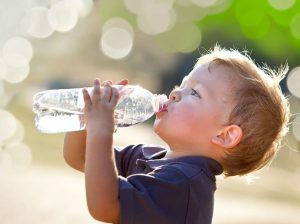 Susceptible health-risk groups (pregnant women, infants, and nursing mothers) should stop consuming water when the level is above 70 ppt. Public Water Systems must provide a public Health Advisory notice. The EPA also recommends that treatment be implemented for all five PFAS when one or more of these compounds are present. Although, PFAS are no longer manufactured in the United States, PFAS are still produced internationally and can be imported in to the country1. PFAS have been in use since the 1940’s and are persistent chemicals that don’t breakdown, accumulate over time in the environment and in the human body. Evidence shows that prolonged exposure PFAS can have adverse effects on human health and the ecology. Agricultural products grown in PFAS-contaminated soil or water, and/or handled with PFAS-containing equipment and materials. Drinking water contaminated from chemical groundwater pollution from stormwater runoff near landfills, wastewater treatment plants, and firefighter training facilities2. Household products, including nonstick products (e.g., Teflon), polishes, waxes, paints, cleaning products, and stain and water-repellent fabrics. Firefighting foams2, which is a major source of groundwater contamination at airports and military bases where firefighting training occurs. Industrial facilities that manufactured chrome plating, electronics, and oil recovery that use PFAS. Environmental contamination where PFAS have built-up and persisted over time – including in fish, animals and humans. While most states are relying on the EPA’s Health Advisory levels (including Massachusetts), some, such as Connecticut, Minnesota, New Jersey, Arizona, and Colorado have addressed other UCMR 3 PFAS pollutants as well. Most research on the effects of PFAS on human health is based on animal studies. And, although there is no conclusive evidence that PFAS cause cancer, animal studies have shown there are possible links. However, PFAS ill-health effects are associated with changes in thyroid, kidney and liver function, as well as affects to the immune system. These chemicals have also caused fetal development effects during pregnancy and low birth weights. PFAS are found at low levels throughout our environment—in foods we consume and in household products we use daily. PFAS in drinking water at levels higher than the EPA’s recommendations does not necessarily mean health risks are likely. Routine showering and bathing are not considered significant sources of exposure. And, while it is nearly impossible to eliminate all exposure to these chemicals, the risk for adverse health effects would likely be of concern if an individual continuously consumed higher levels of PFAS than the guidelines established by the EPA’s Health Advisory. MassDEP is continuing its research and testing for PFAS in Public Water Systems. Large Public Drinking Water Systems have already been tested and sampling indicated that approximately 3% had levels of PFAS detected. MassDEP is currently working with smaller Public Water Systems to identify areas where PFAS may have been used or discharged to the environment. As more information and regulations develop on this emerging contaminant, MassDEP will continue to communicate their findings. Tata & Howard is also available for any questions that may arise, as well as, assist with testing and recommend treatment options for our clients. 1 In 2006, the EPA and the PFA industry formed the PFOA Stewardship program to end the production of PFAs. 2 MassDEP in partnership with the Massachusetts Department of Fire Services (MassDFS), announced in May a take-back program to remove hazardous pre-2003 firefighting foam stockpiles and be neutralized. Manufacturers stopped making PFAS foam in 2002 and have since developed fluorine-free and more fluorine stable foams that are safer to the environment. How do I know if this is affecting my community? Do you have a more detailed map or chart breaking down: where this contamination has been found, at what levels, what is being done to counteract it?